The ONE who never takes a vacation from His care for us! Worship God Where You Enjoy His Creation Most -- On The Beach! St. Andrew will again be offering its annual worship service with Holy Communion at the 16th Street Beach Pavilion in Brigantine. 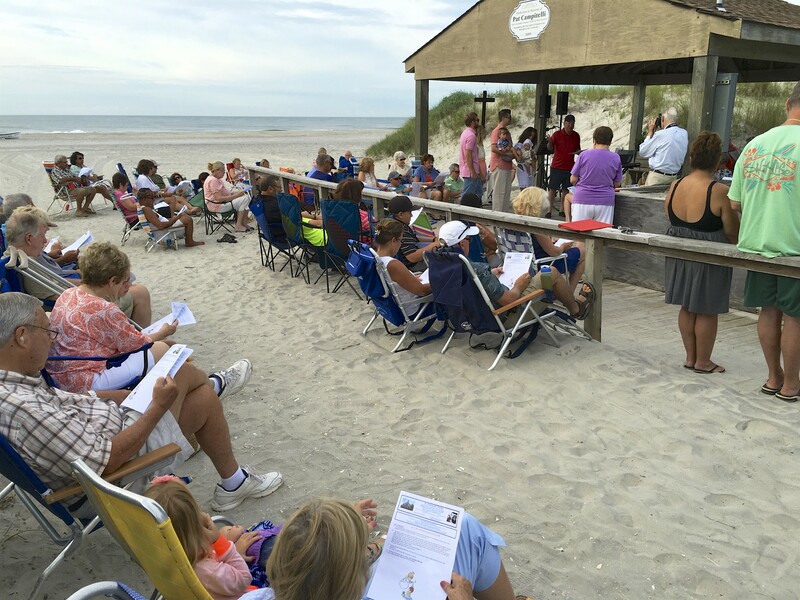 For many, it is the ultimate in Summer Church attendance -- worshipping on the beach next to the beautiful ocean with the summer breezes gently blowing. It is not to be missed! Some Sundays the dolphins are seen swimming and frolicking offshore. Usually once during the summer, we join in a Baptismal Service, with the actual baptism being performed in the ocean! What people are saying about worshiping on the beach! "I love the Beach Service in Brigantine. Keep it up!!" "The people are so friendly. What a beautiful place to go to church!" "Thank you for offering the opportunity to begin our Sunday with worship in such a God-provided, beautiful location!" "Thank you for being a special part of our vacation every year!" "Totally enjoy the Sunday Beach church!" "We now have been attending the beach service for 18 years and are grateful to God for leading us to this worship service. I can’t think of a better place to thank and praise the Lord for all He has done."